Outreach to the neighboring community of Grace has recently been expanded through the Book Nook and the Blessing Box that have recently been set up on Commercial Street. The Blessing Box provides non-perishable food items and personal care products for those who have a need. The Book Nook is a give and take library for children, youth and adults. Donations of items for either station can be made through Grace Church. The monthly newsletter contains much more information you want to know about! Just follow the "Newsletters Plus" tab and download the latest newsletter. In December 2016, Trinity Lutheran Church, Appleton moved weekday activities to Grace. Salvation Church of God, a Hmong speaking congregation, has worshiped at Grace on Saturday mornings for over 12 years. In May 2018, Casa del Alfarero Global, referred to as Potter’s House Church moved into Grace. Potter's House Church is mainly a Hispanic congregation that has been in existence for the last 8 years in Racine, WI and expanding, first in Nicaragua and now in Appleton, WI. They have worship and fellowship at Grace Saturday evenings at 6:30 pm. Four churches under one roof! God is good. We were all "Graced" with sounds of the oboist today (12/16/18). Grace Lutheran Ladies love the Packers! The weather was not great, but the kids did not mind as the celebration was moved inside. 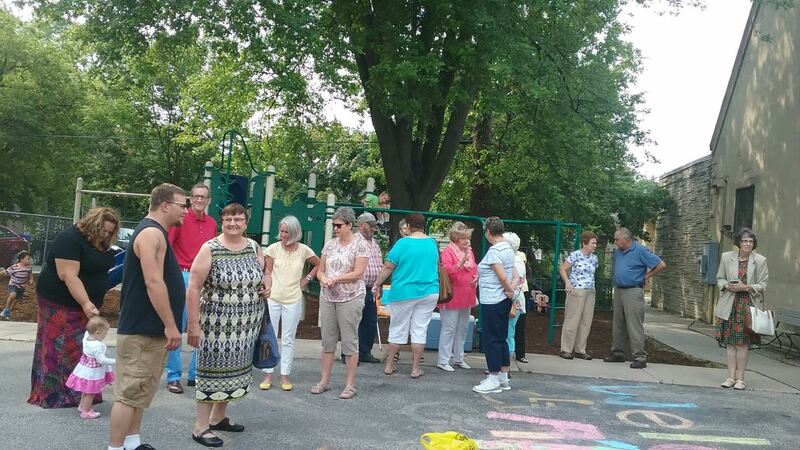 August 19th 2018 was a fun day at Grace Lutheran Church, with polka style worship music lead by Karen and Mark Krull followed by a picnic on the boulevard. The picnic featured great food, live music by Chuck Kruckenberg, and delightful fellowship. Click Here to see more picture from the event. In conjunction with Trinity and Lincoln School, volunteers provided lunch, read stories, and played games with eager children in the area. Lunch & Story Adventure ran Tuesdays and Thursdays in August 2018. May 13th 2018 was a busy day at Grace Lutheran. The Sunday School kids performed two songs for the congregation while Ashlea and Connor were confirmed! What a wonderful day!" December 17, 2017 The Sunday School students led our worship with the Christmas story. The kids are excited to be back in Sunday School. 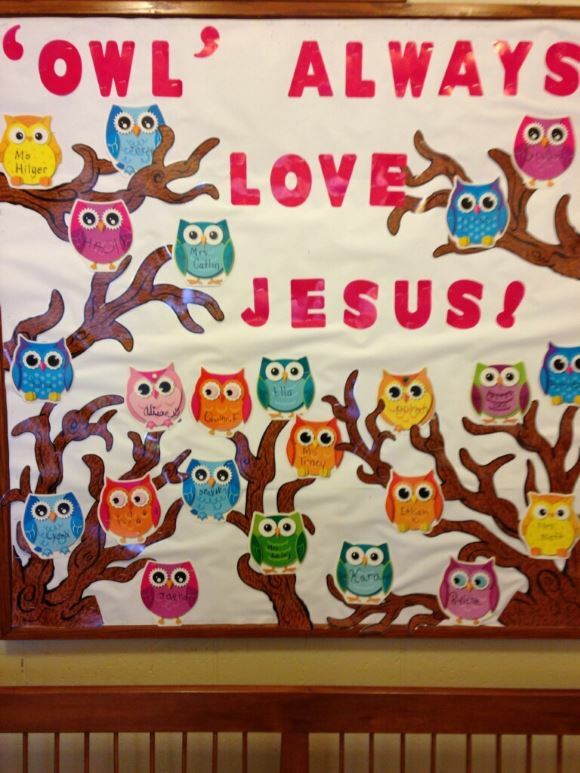 Our theme this year is 'Owl Always Love Jesus.' The kids worked on helping to make an owl bulletin board with their names on owls. Click HERE to view all of the back to school photos. Grace Sunday School children celebrated Reformation Sunday by reading a story about Martin Luther, recreating the Luther Seal, and singing "Here I Stand" during church service. The Tailgate Picnic held on August 19 was a huge success! Thanks to all who organized the event, grilled and served food and and provided live music. View all the picnic photos here. Sunday school students celebrated Palm Sunday by making palm leaves and enjoying Empty Tomb rolls with a disappearing marshmallow. Then students sang Hosana during the second service. Click HERE to view all the photos in the gallery. I am looking forward to meeting and getting to know you. I already know a fair number of you but I am really anxious to get to know the rest of you. Please help me out for a while with your names. We are moving to a new beginning – Easter. So it is with us, we are moving to a new beginning! I am returning to active ministry after a brief rest and you are beginning a new experience with another pastor. May God guide us together as we move and grow together. Click HERE to view photos of Pastor Dan's Installation on March 1, 2017. Baskets of Promise Lenten Service Project. The congregation collected enough supplies to assemble 24 kits! Click HERE for Quilter's Page. See Newsletter for complete calendar.